As you know Guest Blogging has become a very safe method to build backlinks. Many people have opened the business of guest blogging. You have to pay them to write the Guest post for you. Sometimes while browsing other sites, you see the option for guest blogging. You start thinking to write a guest article on that site. You are too interested to get the link back, but you don’t think about the quality of your content. You do irregular guest blogging. The blog owner where you do guest blogging, they worry about their site after observing the irregular post on their site. Webmasters have begun giving more consideration to what gets posted and linked to on their website. Additionally, they are feeling overpowered by the sheer volume of guest bloggers reaching them. As an ever-increasing number of journalists get their pen, blog owners motivate an ever increasing number of solicitations to post. When you begin your guest article using personal letter “such as Dear Sir”, there will be more chances to delete your article from that site. Because the blog owner expects the guest to be more familiar with their blog. They like your long relationship with their site, they do not like a one-time deal. You need to appear regularly on the owner’s blog. You can regularly comment on his blog to show him you are regular on his blog. If you want to write a guest post on any site, should not instant overview on the rule on posting. You need to spend some time to read the posting rule. You will suddenly set the blog owner on edge if you contact him to inquire about information that is already available on the blog. You need to avoid to bother the blog owner. Every website has different policies, you can read those policies carefully. Even if someone hasn’t written guideline, don’t try to violate the border of writing. If you did like this, we will be rejected immediately. If someone allows you to write the guest post, the first task is you need to read those all posting guide carefully. Sometimes you need to show an example of your writing style to the owner of the blog. Sometime you will have to change one or more text in your post on the order of owner. · Make sure you are following all the criteria asked by the owner while writing. For what reason would a blog about hair reclamation need a post about vehicle insurance? Try not to waste your time and the blog owner's time by submitting content that is pointless. How frequently does a blog audience need to scrutinize an article on the proportional, tired subject? Suppose, you have the health & care blog and you have already 10 articles on weight loss. Will you think you need one more article regarding it? See what has quite recently been posted. Complete a site search for the topic you have to write. If the subject has quite recently stayed in contact with death, pick a substitute one. Moderately few blog readers get amped up for general, not-that-supportive content. People do online searches for accommodating information. They subscribe to blogs to get the most important information on a specific topic. Fix this all points in mind while writing content. You can be the expert on a specific topic. That means you have the whole knowledge about that topic but you may have or not more traffic regarding that topic. Don’t use the critical definition of language, people should understand what you want to tell them. · Don’t use metaphors, similes, or other figures of speech. · Don’t use the long phrase it the short word is available for that. You should assume that you are directly talking with visitors. You need to put emotions in writing. Don’t try to write like a machine. Blog owner can do anything on his blog, therefore if he makes any changes in your article don't be surprised. Even he make any changes in your article, your name will stand as the author of that post. This is a good opportunity for you, therefore you need to spread your value there. Grammar is the first thing you needed to generate an impression. If the owner wants small changes in your article, they will do it without your permission. If they want vast changes in your article they will contact you. Don’t combat with the owner. Once your work over doesn’t break the relation with the owner. Don’t forget to say thanks to the blogger. This is the part of your skill growing up, after writing regularly you will find increasing the word ideas. You will become a professional writer. Before starting to write the guest post you need little bit professional writing skill. 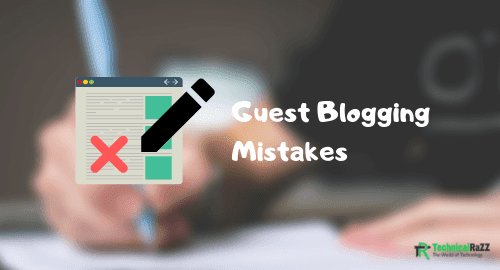 By avoiding these above mistakes, you will have more chances of getting your Guest Blogging in success. If you find this information useful, don’t forget to share it.